The DOW plunged more than 800 points and closed at 25598.7, its worst drop in eight months with all of its components in the red, led by sharp declines in technology stocks. Investors appear to be spooked by rising bond yields that are taking their toll on the stock market. Fears of escalating tensions with China over trade also contributed to the fall. Trump blamed yesterday’s slide on the policies of the Fed, which has raised rates three times this year. During comments at a rally in Pennsylvania on Wednesday, the president said “I think the Fed has gone crazy”, to then double down in a telephone interview with Fox and say " The Fed is going loco". In economic news, Wednesday PPI (MoM) figures hit expectations at 0.2%. Today, Core CPI along with Initial Jobless Claims figures to be released at 12:30 GMT, and Crude Oil Inventories at 15:00 GMT. The Dow broke its 4 months uptrend with the RSI in an oversold state, dropping below 10 and showing divergence with price action on the hourly chart. However, we should note that in such highly volatile conditions, RSI divergence patterns are more likely to fail. 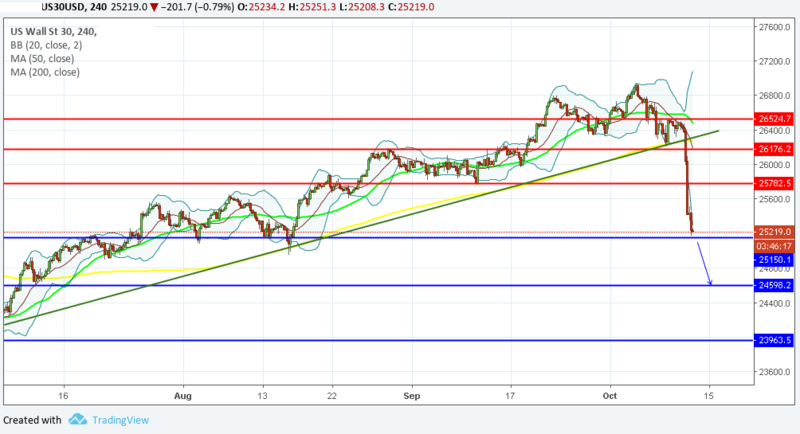 This will be confirmed if price breaks below the 25150.1 support level, in which case further downside to 24598.2 should be expected. Worth noting also, is the bearish breach of the 20 period SMA to the 200 period SMA on the 4H chart.